I have reached the age where I'm trying to hold on to my health and maybe even improve it, but I'd like to do it as naturally as possible. Honestly, chemicals and prescription medications worry me with all the side effects, so if there's something I can do to stay healthy so I won't need all the medications, I'm all for it. I've been interested in essential oils for a while, and have read a little about them. A lot of the things I had read sounded amazing, all the benefits, but I was a little confused about how exactly to use them. 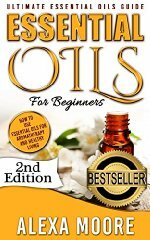 I was given the opportunity to read Essential Oil: Ultimate Essential Oil Guide by Alexa Moore. This book is very easy to understand and so informative. Alexa Moore breaks all the information down chapter by chapter and even gives several great recipes for everything from facial cleansers to massage oils. There's recipes for relaxation and help to sleep, and even cures for headaches. I can't wait to try some of them out! I know I'm not alone in this stressful world with the need to relax and be able to sleep the night through, but I'd like to be able to do it without the risks involved with medications to be able to. With essential oils there are no side effects. So many medications have side effects worse than what you're trying to treat. I'd much rather use natural means if possible. This book makes it easy to understand how to take steps to do just that, improve your health and make life more enjoyable.